Have you ever been in the midst of a crazy toddler tantrum wondering what the heck you’re supposed to do next? Or doubting if your current strategy will even work? Then if it doesn’t “work”, did you teach an important lesson so your child will be able to work through his emotions more appropriately next time? For most parents, the way THEY were disciplined as children is the way they discipline their own kids. It’s like a default setting. The strategy is the only thing they witnessed and experienced, therefore it comes more naturally. If you don’t enter into these situations with a solid strategy, it will be hard to manage the tantrum itself and also you may leave feeling like nothing was really gained from it. It’s important to always remain as consistent as possible with your discipline approach so your child understands the rules and expectations. Inside this post, you will learn the 6 critical mistakes parents make when handling their toddler’s tantrums AND better alternatives. I wouldn’t leave you hanging with just the mistakes ;-). Each mistake has a corresponding alternative that will help you get the results that you want both in the short-term and more importantly, in the long-term. To fully understand why I am considering these 6 things “mistakes,” you must have a general understanding of how a child’s brain works. Without this understanding, you are just taking a shot in the dark with your discipline strategies. It is to our advantage that science can tell us so much about the development of certain regions of the brain and how that affects the way children process language and emotions compared to adults. Using science-driven strategy can truly help us parents utilize the most effective methods and see the positive effects for years to come. Dr. Dan Siegel, author of No Drama Discipline, paints a very clear picture of how a child’s brain works and particularly how that leads them to respond to different types of discipline. He says you can think of the brain as 2 main areas- the downstairs brain and the upstairs brain. The downstairs brain, consisting of the brainstem and limbic region, is considered to be more primitive because it is responsible for our most basic operations such as strong emotions, instincts like protecting our young, and basic functions like regulating sleep and wake cycles, digestion, and breathing. This region is the source of our reactivity. When a toddler throws his toy when he doesn’t get his way, the downstairs brain is to blame! The upstairs brain, which houses the cerebral cortex, is responsible for more complex and sophisticated thinking such as sound decision making, planning, emotional regulation, personal insight, empathy, morality, and adaptability. This region is not developed at birth but instead begins to grow during infancy and childhood. These qualities are the things that WE are responsible for teaching our children as they are not born with them! As you can gather from that information, our aim should be to engage the upstairs brain so we can actually TEACH our kids valuable lessons in emotional regulation. The only path to that upstairs brain is through the downstairs brain. If the downstairs brain is in a reactive state, then we will not be able to access the upstairs brain and our attempts at “teaching them a lesson” will be toast. Why it doesn’t work: During a tantrum, a child cannot rationally process the words you are saying. I’m sure your explanation makes a ton of sense, but it’s just not the right time for in-depth reasoning. Not only is it ineffective, but it tends to exacerbate the issue in most cases. Better alternative: Connect with your child by giving a hug or even just a hand on their shoulder or arm. This lets them know that you are present with them and ready to support them through this tough time. **Some kids do NOT like to be touched during a tantrum so if that’s the case for your child, do not connect physically. Just say on their level and remain calm. Once you’ve connected, provide a label for your child’s feelings. “You feel very angry because you can’t have that new toy.” You only need to say this once. No need to elaborate or explain. Why it doesn’t work: When you get yelled at, does it make you want to do better or does it just make you defensive and angry? A child feels the same way. Yelling at them enrages their downstairs brain which then closes off access to the upstairs brain. Logical solutions will not be processed as the child may just completely shut down. Better alternative: In order to speak calmly, you may need to take a quick timeout for yourself to regain composure. Take a minute or two (in a separate location if possible) and do some deep breathing until you feel calm and ready to tackle the tantrum with your child. Sometimes this will not be possible if you are the only one home and your child is getting aggressive. In those cases, you will definitely have to stay with your child to keep things and people safe. If you cannot leave the room for a timeout, then find a phrase or mental image that helps you calm down. For me this phrase would be “he is not giving you a hard time, he is having a hard time.” And then I picture him on the day I gave birth. The tiniest, sweetest little soul I had ever seen. Sometimes those things will take the edge off a little and allow you to move forward with less anger. Better alternative: There is no need to try and stop a tantrum. A tantrum is totally normal and healthy and just shows that they need some help sorting out their feelings. Don’t miss this opportunity to engage the upstairs brain! Ride out the tantrum with them and then when all is calm, the upstairs brain will be ready to process and learn the intended lesson. Why it doesn’t work: Many people will tell you to just ignore the tantrum so the child doesn’t get any attention for it. The problem with this is there is no teaching going on. And more often than not, the ignoring will just enrage the downstairs brain which we know poses a roadblock to the upstairs brain. Devaluing your child’s feelings by saying “calm down!”, “stop crying!” or “it’s not a big deal” only shows him that having emotions or feelings is not acceptable. Think about a time when you were really upset about something, would it have helped if someone had told you to calm down? HECK NO. There is nothing more frustrating than someone telling you to calm down when you are feeling upset about something important to you. It absolutely makes the situation 10x worse. Better alternative: A better option is to go over to your child, get down on their level, and just be present with them. You are on the same team. They will take comfort in knowing that their parent, their rock, is supportive of ALL feelings, not just the happy ones. Even though it will be hard, try and empathize with them. It’s hard as an adult to remember how something that seems so trivial is SO upsetting to a child with an undeveloped upstairs brain! It always helps me to remember that my child isn’t giving me a hard time, they are having a hard time. This phrase gets my emotions and brain in check so I can truly move from being annoyed/upset to being a helper and teacher. Why it doesn’t work: Physical punishments, such as spanking, have been proven ineffective in the long run. It may work to stop the behavior or tantrum NOW, but at what cost down the road? This is just another thing that isn’t focused on engaging the upstairs brain. A child isn’t going to learn valuable lessons by being hit. All it will do is enrage the downstairs brain and add fuel to the fire. More often than not, parents spank out of anger. They are at their wit’s end and can’t handle anymore, so they hit the child in hopes that it stops the behavior and teaches them a lesson. There is no lesson here, though. There is a child who just saw their parent unable to handle their emotions and act out in an inappropriate way to get their point across. That’s his model. Now he knows to do the same thing when he’s upset or has big emotions. If you don’t want to raise a bully, then don’t be one. As hard as it may be, we need to realize just how much our kids mimic what they see us do. “Do as I say, not as I do” is not the way it works. Physical punishments can create fear. This means that your child may stop the behavior in fear of getting punished from you, BUT what will they do when you’re not around? They never actually learned how to regulate their emotions so they don’t have those skills. You want a child’s good behavior to come from a place of genuine desire, not from a place of fear. At the very most, even if you’re someone who doesn’t believe the science that says spanking can have long-term negative effects such as depression and anxiety, just know that it is ineffective in teaching the valuable lessons that you are intending to teach. There are better, gentler, ways to handle the behavior that do not jeopardize the relationship between parent and child AND that are all around more effective in teaching rules and expectations. Better alternative: Instead of enraging the downstairs brain and making the upstairs brain inaccessible, try using a culmination of the alternatives mentioned above. 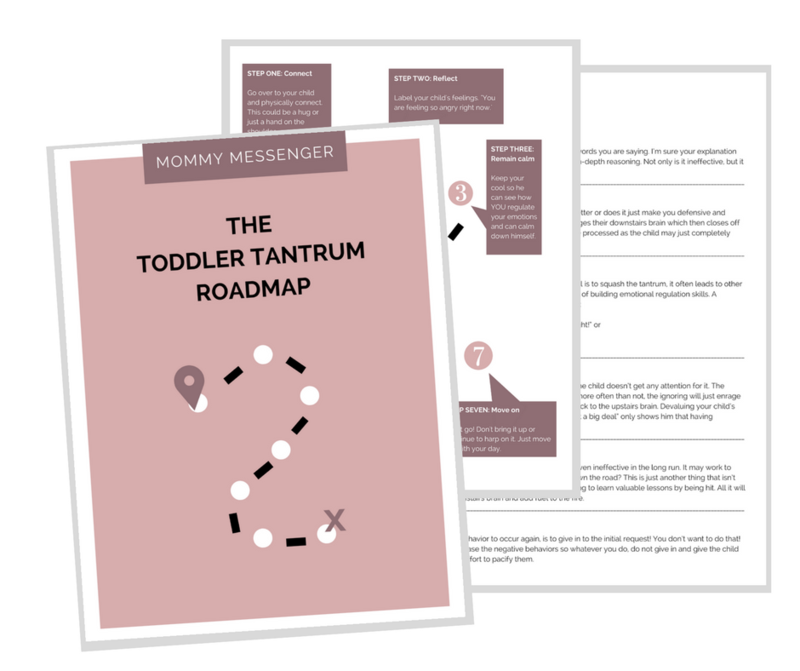 Using all of these strategies to address a tantrum will create far better results than spanking. You will be encouraging your child to release emotions in a healthy way, verbalize how they feel, and regulate their emotions in the future through your teachings. Why it doesn’t work: I saved the best for last! The #1 way to get a behavior to occur again, is to give in to the initial request! You don’t want to do that! We are trying to decrease the negative behaviors so whatever you do, do not give in and give the child what they want in an effort to pacify them. This will only make your job harder in the future. Put in the work NOW so you can sit back and enjoy your kids in the years to come. If Sally asks for a piece of chocolate cake for breakfast and you say “no”, then that’s your final answer even if she throws herself to the ground crying and yelling that you’re “the meanest mom ever!” If you give her the chocolate cake to stop her from crying, then you best believe she will do the exact same thing next time! Better alternative: A better option would be to offer help or a yes with conditions. Offering help would work in a situation where you placed a demand such as “go get your shoes on” and the child said “no” or started tantruming. Instead of battling it out and creating an unnecessary power struggle, just offer to help him get his shoes on and then carry out that action (so go over to him and start helping him put his shoes on). A yes with conditions just means that when a child initially asks for something you don’t want them to have, then respond with a yes instead of a no, whenever possible. So you are technically still saying no to ice-cream for breakfast but without actually saying it. You are phrasing it in a way that the child still gets to hear a “yes” but it’s on your terms. Offering a yes with conditions is not something you need to do every single time. Of course, a child needs to hear “no” every now and then! I’m just saying that it can be balanced with the yeses in order to lessen the power struggle. It’s time to start seeing tantrums as opportunities to engage the upstairs brain and teach the lessons our children need and deserve in order to become emotionally healthy teens and adults. We are setting the foundation NOW. Hi thanks for a very insightful article. Just a quick question. What age range do you believe this applys to? I know that I can definitely implement this with my 3 1/2 year old. However my 18 month old, who is delayed in her speech which makes things a lot harder, is the queen of tantrums. Her older sitsters threw fits when they were younger, but not like #3! She is the dictionary definition of a temper tantrum. The flinging herself on to the floor screaming and crying. This happens very quickly, 0-100 in just a couple seconds of not getting what she wants. I’m struggling because I know some of it is just frustration because in her mind this is the only way she knows how to communicate. However I’m not sure if most of the list is way over her head or not. She is so incredibly sweet, however when she is hungry or not getting her way, it is very hard to console her. Thanks! Have you tried teaching her sign language? Being able to communicate little things like, “more,” “done,” and “sleep” can drastically cut down on frustrations between parent and baby. Hi Jessica! So sorry for the late response – I missed your comment somehow! The underlying tactics taught in the post can definitely apply to an 18-month-old but you’ll just have to keep in mind that all of the language (both what you’re saying and how much you’re saying) will have to be simplified a bit. Especially with the speech delay. It will be more a matter of taking action at that age rather than all of the talk. So if she’s upset because she didn’t get something she wanted, stay close, give a quick reflective statement to help build that emotional literacy (understanding emotion words so she can eventually express her feelings through words) such as “You’re feeling upset because I won’t let you have a cookie” and then let her ride out the tantrum. She’s just expressing her feelings the only way she knows how like you mentioned. I agree with Hope that getting some basic signs may be helpful for her. I used the Baby Signing Time program with both of my kids and they loved it! Always pair your signs with spoken words so she still hears the word. Sign language is GREAT for building language! It will always be easier to PREVENT tantrums rather than remediate. Make sure snacks are on a good schedule so she doesn’t get hangry, give her at least 10 minutes of one-on-one time per day to fill up her bucket, and try to give her simple choices (pointing to the cup she wants) that will allow her to exercise some positive control (instead of always being told no). Loved it, thanks a lot. Splendid Article. Descriptive and helps a lot in understanding from a toddler’s perspective. Thank you.